When I was seven years old I moved from the cold and rainy Andean capital of Bogotá to the perpetual-summer city of Cali in the heart of the Cauca valley. My shoulder became covered in sun-made blisters which I tore off with a needle, and at night, when I went swimming to cool off in an unlit pool I felt bats hit the back of my hand as they swooped down for a drink. There I learnt that things rot different in the shade of tropical heat. Within hours a dead rat beside the pool would begin to swell while insects crawling in through nostrils, ears and under eyelid slits only halfway drawn down. Its skin would seem to boil with larval activity and within a day mandibles and grapple-hook legs would weave zippers from its skin and begin to slide them down slowly as they turned a rat outside-in from the inside-out. So I watched them pick it apart bit by bit, thread by thread, fleck by fleck. Stop motion capture, inversed and reversed. Puzzle-piece rat, crumpled-paper rat, flower-bud rat. Disassembled, unfolded, and brown-blood blooming. A butterfly-carcass rat making a cocoon of a thousand bellies. A half imagined outline of a body on brown leaves and nothing left of it in the whole wide world but my memory. In “A Field Guide to Common Edible Plants” Natassja Traylor unweaves the hem of the natural world like all those insects I gazed at as a child, and dream about even today. She takes the concrete world and disassembles it in her own image like a myth in reverse. Plays metaphorical herbologist with the order of plants while actually examining the so-called “disorders” of her own personal taxonomy. Similarly, in a way to ask and to answer Kirstin Allio upturns stones and allows the white belly pupas and frizzle-leg centipedes scurry away, dissecting how sometimes that which remains unsaid can sometimes speaks more loudly than any declaration shouted from atop any rooftop. Just like every essay in this issue, meticulously and exhaustively, picks apart and transforms the carcass of experience in the cocoon of memory, until, as Sarah Heston writes in Con, “Coincidence becomes meaning,” and we are all implicated in each other’s unyielding metamorphoses. 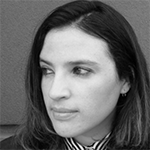 Lina M. Ferreira C.-V. has a creative nonfiction MFA and a literary translation MFA, both from the University of Iowa. Her work in fiction, nonfiction, translation and poetry has been feature in a few journals, including The Bellingham Review, Fourth Genre and Brevity. Her book Don’t Come Back (Ohio State University Press, 2017) was a finalist in the Essay Press Open Book contest, and her essays have been nominated for two Pushcart Prizes. She is an assistant professor of creative writing at Virgina Commonwealth University.